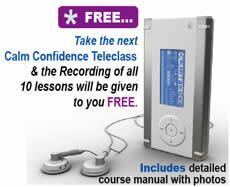 A Teleclass is a live workshop that is conducted over the telephone like a conference call*. 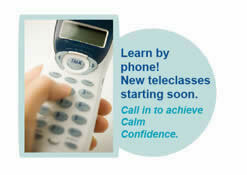 Once you register for a Calm Confidence Teleclass, you will receive an email with the telephone number and access code for your Teleclass. Be sure to put this information in a safe place where you can easily find it. Step 1: Take care all the lovable distractions in your home i.e. dogs, kids, spouses, etc. then find a quiet comfortable spot from which to call. Step 2: Disable "call waiting" before dialing in. Check with your local carrier for specific instructions for temporarily disabling and then re-enabling call waiting. Step 3: We recommend the use a headset or a speaker phone to allow hands-free full participation in the exercises. 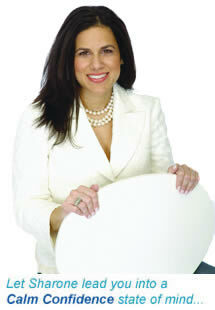 Sharone will be leading you through breathing and relaxation techniques in which you may find a corded telephone and handset quite cumbersome. Step 4: If you have a two-line phone, turn the ringer off on the second line. Otherwise, if you get a call during the call, it will distract you and shift your focus away from the lesson. Step 5: Call the Teleclass phone number at the designated time. If you have trouble placing the call, first double-check the time, time zone, and number of the call. Most difficulties are solved with this step. If the phone rings but won't connect, one of two things has occurred. You might have mis-dialed or your timing is off. Check the number and redial. If still no success, again, check to see if you have the correct meeting time and are referencing the correct time zone. If you receive a busy signal, it means you dialed incorrectly. Check the number and dial again. Again, if you lose this information please contact Sharone as soon as possible. * Regular long distance charges will apply, but there are no additional fees.